After my last article, American Fascism: Trumpism, I received some not so nice comments on my social media. I was bit surprised because in the past trolls only came after me when I wrote about racism or feminism. We can agree to disagree, but please let your arguments be based in fact. 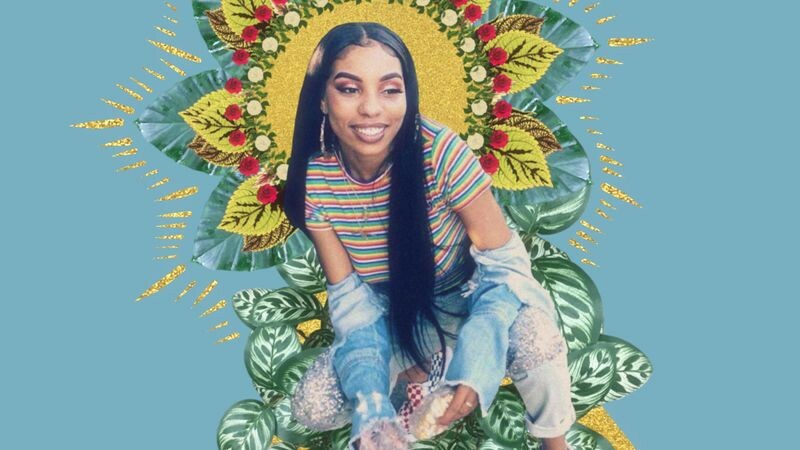 After the death of Nia Wilson last week, I was heart broken and felt hopeless. My hopelessness is not because racism exists, but the glaring silence from white people who claim to be color blind, liberals, or compassionate humanists. Your silence when people of color are harassed or murdered by racists is complicity to the people and policies that encourage this behavior in the name of making America great. 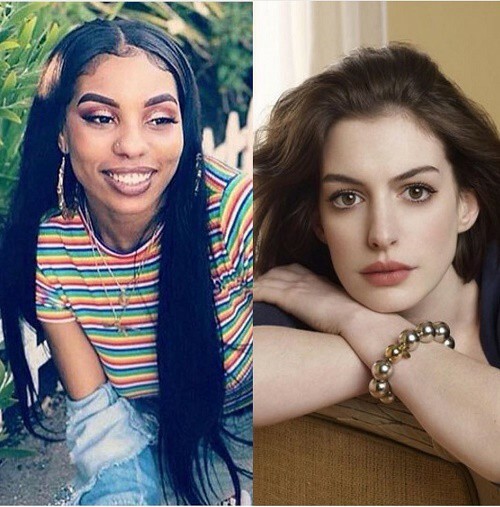 Nia Wilson and Latifah Wilson were stabbed last Sunday night on Oakland’s BART train. Nia died. With the killer still on the loose, BART police did not release information about the attack or suspect until late Monday afternoon even though video captured the attack and the suspect had run-ins with BART police in the past. Black Twitter and other black media outlets released information about the attack immediately trying to get #JusticeforNia a trending topic. I spent all day Monday waiting for CNN and other major networks to break news about the attack. It was not until around 4pm CST that major news outlets released information about a killer on the loose and Nia Wilson. Educator Jane Elliott on white privilege and trading places with a black person. For years, people of color have been harassed and killed by police and racists only to be told that we were imagining or exaggerating encounters. Enter the camera phone and even with video evidence of police misconduct and unprovoked racist attacks the response is “Well, what did they do or why didn’t they just comply?” The same behavior exhibited by a white person is deemed exercising freedom, but when a person of color exercises their freedom then we are being belligerent and disrespectful of police authority. A white woman cursed at police officers and did not get a ticket. Had that been a person of color, they would have been arrested or worse shot. I have been pulled over for driving while black. When I question the cops about probable cause and after informing them that I am an attorney, then I am told it was a mistake. My attorney credentials help me, but not the average person of color pulled over by police for no reason. A black special education teacher had the police called on her for “abusing the system” using coupons. There was a television show called Extreme Couponing featuring white women being budget conscious and frugal, but a Chicago black woman using a coupon at CVS has the police called on her because the store manager assumed a manufacturer’s coupon was fake. The double standard is enraging. My hopelessness is because the historical silence of white Christians and good people will yet again cause harm to people of color and set the country back. Dr. King said, “We will have to repent in this generation not merely for the hateful words and actions of the bad people but for the appalling silence of the good people.” The silence of the good people is what is empowering Trump and his supporters to believe their racism and xenophobia are okay. People of color are being harassed, spit on, having 9–1–1 called on them for merely being in spaces a racist deems not for them. 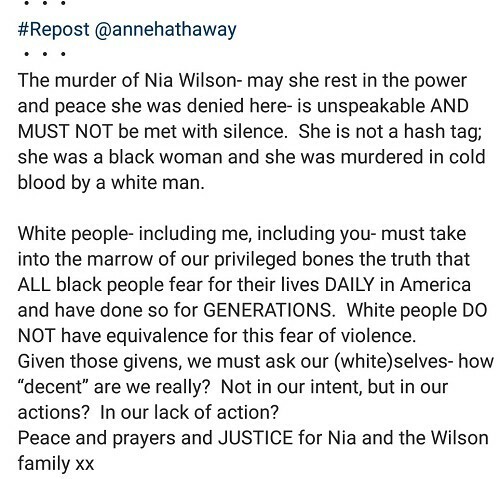 On Friday, actress Anne Hathaway tweeted about white privilege in response to Nia Wilson. What she said was exactly what was eating at my heart. Thank goodness she spoke out! We need more white people to understand their greatest privilege in America is the color of their skin and based on that alone they will be treated better than people of color in this country. NPR noted the police are being used to exclude black people from public spaces. A black firefighter had police called on him. A black 12 year old had the police called on him while delivering newspapers. Black tenants and homeowners are having the police called on them because their white neighbors don’t think they belong. Actor Ving Rhames was held at gunpoint by police in his home because a neighbor alleged a black man was committing a robbery. Mexican Americans are being called rapists, animals, and drug dealers by their white neighbors. Instead of the media calling these acts racist, the white person is usually referred to as “unhinged” or some sort of mental illness. Two police officers beat a Latino man who was a National Guardsman claiming that he was “fake American.” A white woman calls a black man a monkey and spits on him in NYC. A white woman harasses a black family saying they “don’t belong here” and “get out of Berkeley.” When cops arrived, she pretended to be the victim. But for a white family who corroborated the story of the black family, the black family would have been arrested. A Latino youth pastor was harassed and assaulted with his youth group while being called a “half breed” by a white man. A black woman died after being denied ambulance transport because the medics assumed that she could not afford the ride. A white man harasses a black woman with her child in her car over a parking spot. When the woman’s boyfriend comes to her defense, the white man shots him dead and police say it is justified because he was standing his ground. He was the aggressor and instigator! This is 2018 in America. The attempts to blame this on mental illness is as insulting as the racist who commit the attack. 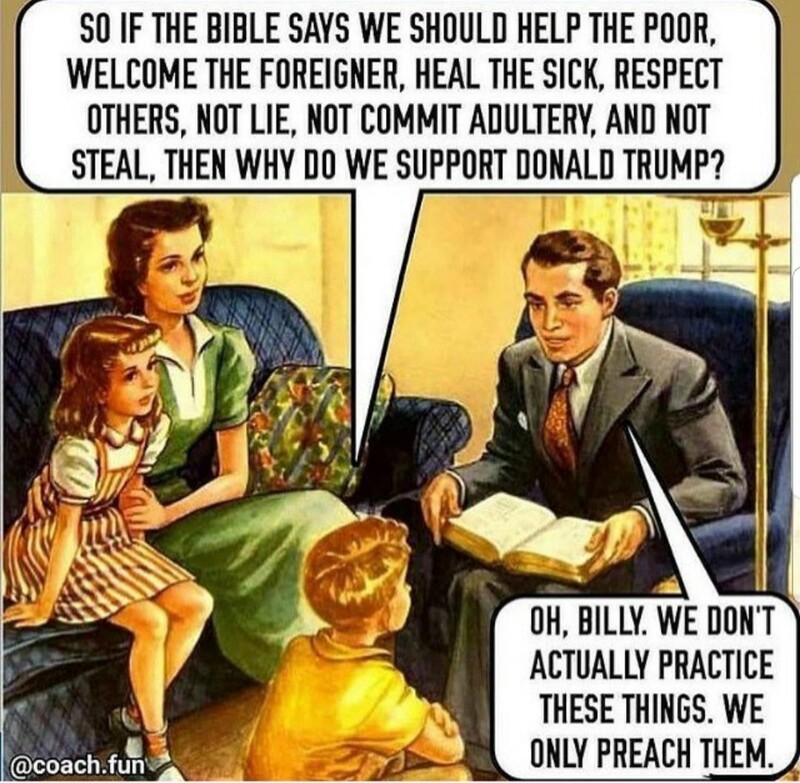 God save America from apathy and the appalling silence of those who claim they do not support racists, Trump, or his policies but remain silent. 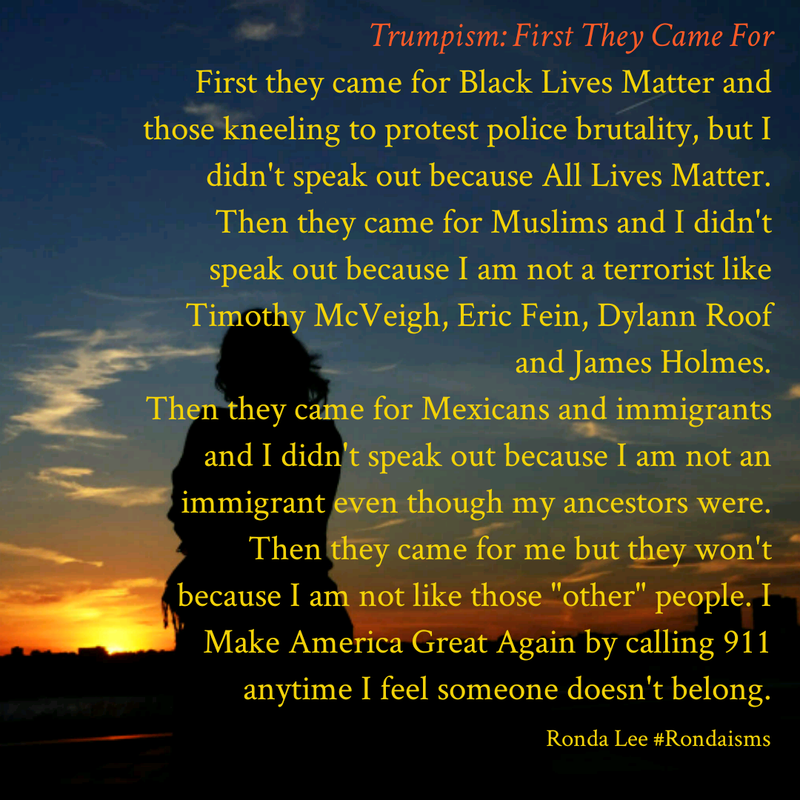 They are no different than those Martin Niemöller wrote about in First They Came for the Socialists.